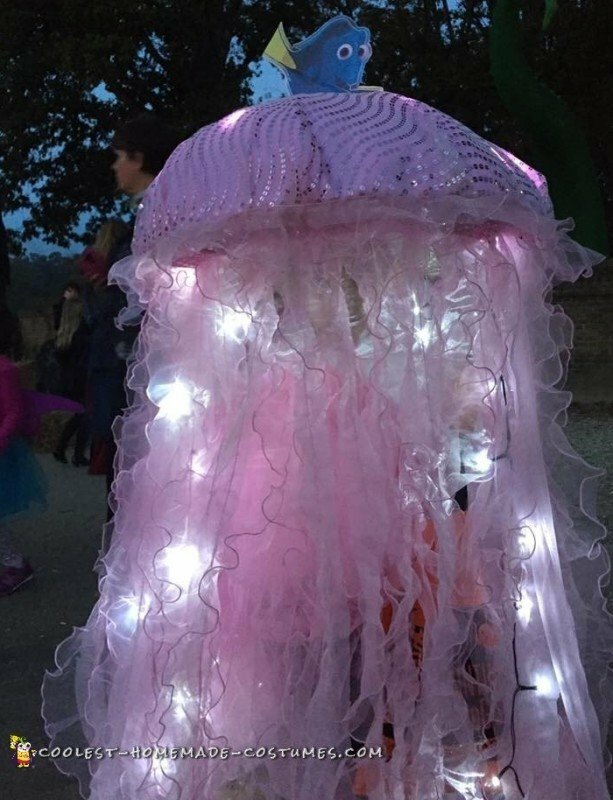 My daughter and I were watching Finding Nemo and as soon as she saw the part that Dory and Nemo jump on the tops of the jellyfish, she decided she wanted to be a jellyfish for Halloween. She wanted to use a clear umbrella as the base but we decided that a hat style might be easier for her to wear while trick or treating. 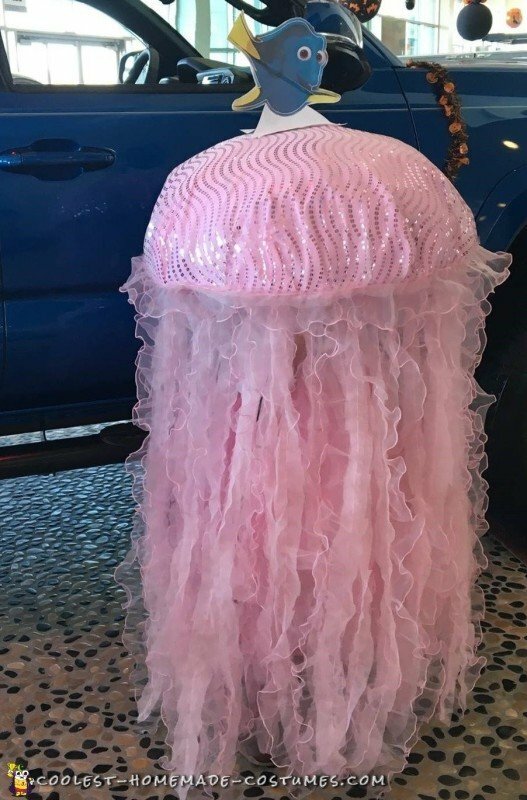 The base of the jellyfish is a sombrero. I filled the brim with newspaper and bubble wrap so it would still be fairly lightweight and covered it with a piece of scrap fabric I had. I used mini battery operated led light that I found at the dollar store and glued them under the brim so they would hang down. The tentacles are strips of ruffled fabric glued around the brim of the hat. I finished off the outfit by making a pink tulle skirt to go underneath. The sombrero sat on her head and tied under her chin with a ribbon. Everywhere we went people wanted to take pictures! People loved that it lit up at night and kept asking where we found it. They were shocked when I told them I made it! Our whole family decided to go with the theme. 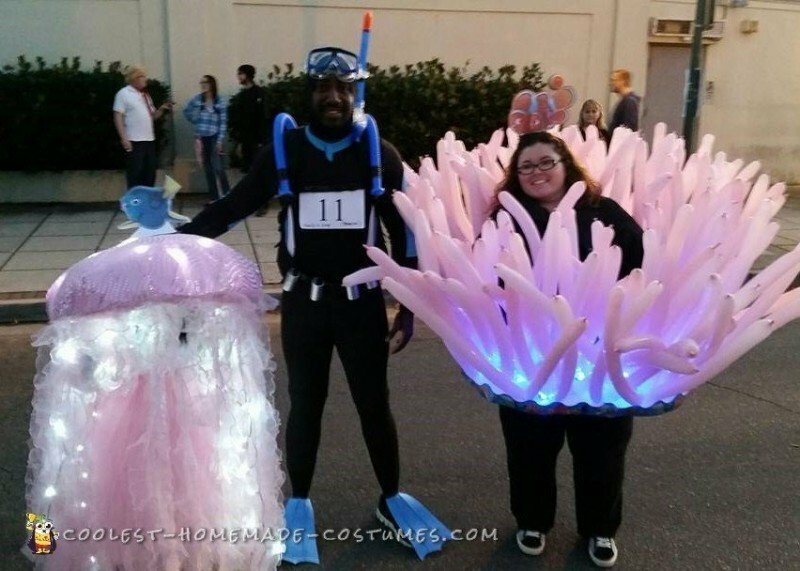 My daughter was the jellyfish, I was the sea anemone, and daddy was the deep sea diver! Making our costumes has become a tradition in our family!